Who were the Massachusetts 54th? 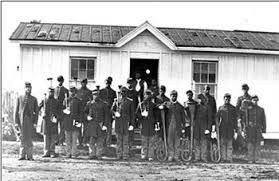 The Massachusetts 54th was an all African-American Regiment. Most of them did not know how to read or write. When they arrived at the camp, almost all of the white soldiers thought that they would be useless in this war. They had to learn the simplest stuff at first like learning how to march because some did not know the difference from left and right. None of them had their guns so they had to improvise and use sticks and other objects. The person that taught them was an Irish man and he wasn't to fond of them. When a soldier ran away they tied his hands and they whipped his back for it. The person that is in charge of the socks and shoes and other supplies did not want them to have new stuff because they didn't think that they needed it. Shaw goes in and persuades him to give them new shoes and socks. Some of them were kind of nervous about going to South Carolina because they could be enslaved easily. When they arrive there, Sargent Rawlins gets promoted to Sargent Major, the highest rank an African American can get. They had a party thrown for them that night. The false reason that they got told was to go into this town and get supplies. The real reason was to steal all of the valuables and burn the town. They try shooting at a guy but they all miss. One African American goes into a home and comes back outside then the owner of the house comes outside and talks badly about him and smacks her. Then the guy that is a higher rank than Shaw shoots him. The African Americans expected to get to South Carolina and fight. At first all they did was plow clear paths. Jupiter and another white soldier got in a dispute that the 54th would be a better fighting force than the whites would. The African Americans came out and formed two rows. First row knelt down while the second row stood up. The South came in on horses at first and they weren't too effective. Then soldiers on the ground came in and they charged at each other. Finally the south retreated. Thomas got shot in the shoulder and a couple others were injured and few were dead. The General said that the first group to go in, that most of them would probably die. Very few will make it out alive. 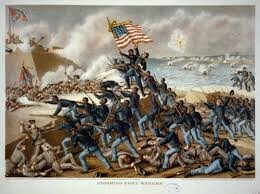 Then Colonel Shaw said that his regiment would be proud to do this job. The General at first doesn't like this idea because they just fought two days ago and haven't had that much sleep. Shaw then talks about how their fighting was a sight to see and the General allows them to go in first. On their way down to the beach all of the white soldiers are cheering for them. When they get down by the beach, they are getting shot at by a bunch of cannons. They are far enough away from the cannons at night and they wait in the sand dunes until night. At night they charge up the hill of the bunker and Colonel Shaw gets shot and dies. Then Jupiter goes after him and gets shot too. They get into the fort and begin to burn stuff. They start to charge but the fort is full of rebels. About half of the 54th regiment die, the rebels just throw all of there dead bodies into bunkers. The South won this dispute and the North never took their fort.